To view the results of the analysis, the relax results window will have been automatically opened. If it was closed, click on the “View→Results viewer” menu entry or the “Results viewer window” button in the toolbar to open the window. This window will list all of the *.out text files and *.agr 2D Grace plots created by the auto-analysis. By double clicking on the file, these can be opened. The operating specific text editor will be launched for the text files. For the Grace files, the installed Grace version (Xmgrace, QtGrace, or GraceGTK) will be launched. # Parameter description:  The dispersion model. Excluding the deselected spin systems with the model `None' and those with no statistically significant dispersion, `No Rex', it can be seen that in some cased the `CR72' model is selected whereas in others the `NS CPMG 2-site expanded' model is selected. The differences between the `CR72' analytic model and the `NS CPMG 2-site expanded' numeric model are insignificant. To see this, open the CR72/chi2.out and NS CPMG 2-site expanded/chi2.out text files in the ∼/dispersion/log_non_clustered directory and compare the optimised chi-squared values (this can be performed with the mouse by using the pipe editor window, changing the current data pipe, and double clicking on the files in the results viewer window for each data pipe - see below for more details). Deselecting spin ':2@N', the maximum dispersion curve difference for all curves is 0.772528040762 rad/s. Deselecting spin ':3@N', the maximum dispersion curve difference for all curves is 0.572686080104 rad/s. Deselecting spin ':4@N', the maximum dispersion curve difference for all curves is 0.20753288407 rad/s. Deselecting spin ':7@N', the maximum dispersion curve difference for all curves is 0.184120905625 rad/s. Deselecting spin ':10@N', the maximum dispersion curve difference for all curves is 0.746360942576 rad/s. Deselecting spin ':11@N', the maximum dispersion curve difference for all curves is 0.372702361421 rad/s. Deselecting spin ':13@N', the maximum dispersion curve difference for all curves is 0.261522940719 rad/s. Deselecting spin ':15@N', the maximum dispersion curve difference for all curves is 0.743965404051 rad/s. Deselecting spin ':16@N', the maximum dispersion curve difference for all curves is 0.198783344901 rad/s. Deselecting spin ':17@N', the maximum dispersion curve difference for all curves is 0.469568638477 rad/s. Deselecting spin ':18@N', the maximum dispersion curve difference for all curves is 0.720840385548 rad/s. Deselecting spin ':19@N', the maximum dispersion curve difference for all curves is 0.290773963568 rad/s. Deselecting spin ':20@N', the maximum dispersion curve difference for all curves is 0.983669594767 rad/s. Deselecting spin ':22@N', the maximum dispersion curve difference for all curves is 0.507488886605 rad/s. Deselecting spin ':24@N', the maximum dispersion curve difference for all curves is 0.984086643389 rad/s. Deselecting spin ':25@N', the maximum dispersion curve difference for all curves is 0.638104572082 rad/s. Deselecting spin ':29@N', the maximum dispersion curve difference for all curves is 0.525261970487 rad/s. Deselecting spin ':33@N', the maximum dispersion curve difference for all curves is 0.822112754666 rad/s. Deselecting spin ':35@N', the maximum dispersion curve difference for all curves is 0.713976877685 rad/s. Deselecting spin ':36@N', the maximum dispersion curve difference for all curves is 0.413602640091 rad/s. Deselecting spin ':37@N', the maximum dispersion curve difference for all curves is 0.302953864843 rad/s. Deselecting spin ':40@N', the maximum dispersion curve difference for all curves is 0.401535026435 rad/s. Deselecting spin ':41@N', the maximum dispersion curve difference for all curves is 0.805657060225 rad/s. Deselecting spin ':43@N', the maximum dispersion curve difference for all curves is 0.582523964429 rad/s. Deselecting spin ':44@N', the maximum dispersion curve difference for all curves is 0.325638582443 rad/s. Deselecting spin ':45@N', the maximum dispersion curve difference for all curves is 0.947956877688 rad/s. Deselecting spin ':49@N', the maximum dispersion curve difference for all curves is 0.872396631779 rad/s. Deselecting spin ':50@N', the maximum dispersion curve difference for all curves is 0.403543891199 rad/s. Deselecting spin ':56@N', the maximum dispersion curve difference for all curves is 0.468272490195 rad/s. Deselecting spin ':57@N', the maximum dispersion curve difference for all curves is 0.634215047495 rad/s. Deselecting spin ':58@N', the maximum dispersion curve difference for all curves is 0.953109267554 rad/s. Data pipe 'CR72 - relax_disp (Mon Feb 17 18:00:16 2014)':  The pA parameter of 0.50003 is less than  0.50100, eliminating the spin cluster [':6@N']. Data pipe 'CR72 - relax_disp (Mon Feb 17 18:00:16 2014)':  The pA parameter of 0.50001 is less than  0.50100, eliminating the spin cluster [':38@N']. Data pipe 'CR72 - relax_disp (Mon Feb 17 18:00:16 2014)':  The pA parameter of 0.50001 is less than  0.50100, eliminating the spin cluster [':42@N']. Data pipe 'CR72 - relax_disp (Mon Feb 17 18:00:16 2014)':  The pA parameter of 0.50001 is less than  0.50100, eliminating the spin cluster [':45@N']. Data pipe 'CR72 - relax_disp (Mon Feb 17 18:00:16 2014)':  The pA parameter of 0.50000 is less than  0.50100, eliminating the spin cluster [':46@N']. Data pipe 'CR72 - relax_disp (Mon Feb 17 18:00:16 2014)':  The pA parameter of 0.50002 is less than  0.50100, eliminating the spin cluster [':47@N']. Data pipe 'CR72 - relax_disp (Mon Feb 17 18:00:16 2014)':  The pA parameter of 0.50000 is less than  0.50100, eliminating the spin cluster [':48@N']. Data pipe 'CR72 - relax_disp (Mon Feb 17 18:00:16 2014)':  The pA parameter of 0.50002 is less than  0.50100, eliminating the spin cluster [':60@N']. Data pipe 'CR72 - relax_disp (Mon Feb 17 18:00:16 2014)':  The pA parameter of 0.50000 is less than  0.50100, eliminating the spin cluster [':62@N']. The exchange rate for most spins experiencing exchange is between 1000 and 2000 s-1. Opening the pA.agr file, it can be seen that the population of state A is approximately 0.98. A number of spins have much lower values than this, but their errors are huge meaning that all but 3 are statistically the same as 0.98 (note that a proper ANOVA statistics analysis would be required to make such statements). 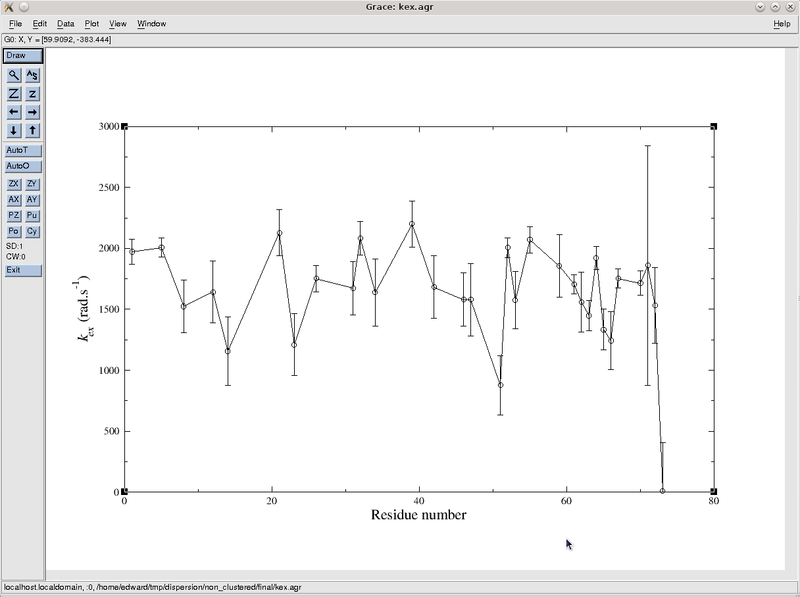 To improve the appearance of this plot, please refer to the Grace software documentation.